Home > Extra Long Beds 80, 84, 90 and some 96 inches long! Our extra long bunk beds and loft bed are handcrafted from natural finished Ash in Vermont. They come in three lengths, 80", 84" and 90" to fit (6'8", 7' and 7' 6"). 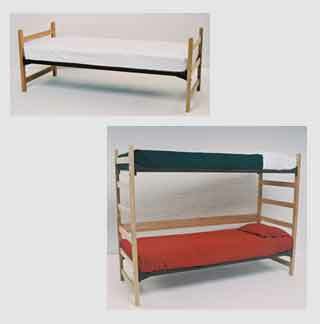 These bunk and loft bed frames are also available in 36" dorm width and 39" twin width. Hand constructed from natural finished ash, our extra long bunk and loft beds are carefully assembled to provide many years of care-free use. They feature a long mattress support system that is firmly bolted to the bed ends for maximum strength and rigidity. (Some manufacturers use hook and pin systems which assemble quickly but allow more flexing and are more likely to become dislodged during rough housing.) The steel supports are dark brown in a durable power coated finish. Please allow 1-2 weeks for delivery for these extra long beds using wood slat bottoms (3-4 weeks for beds with steel spring units). Pieces may arrive separately. Quantity pricing available - please call. These extra long bunk beds are not intended for use by children under the age of 15. We also have extra long mattresses and extra long sheets for these beds. Tall Paul's Extra Long Stackable Single/Bunk Bed Frame comes in multiple lengths and widths. This bed can also be bunked with another Tall Paul Stackable Single Bed. The Extra Long Day bed is a versatile piece of furniture - a long bed that also doubles as a couch. Tall Paul's Extra Long Bed Loft comes in variable lengths and widths and the raised platform provides space below for a desk, dresser or lounge chair.